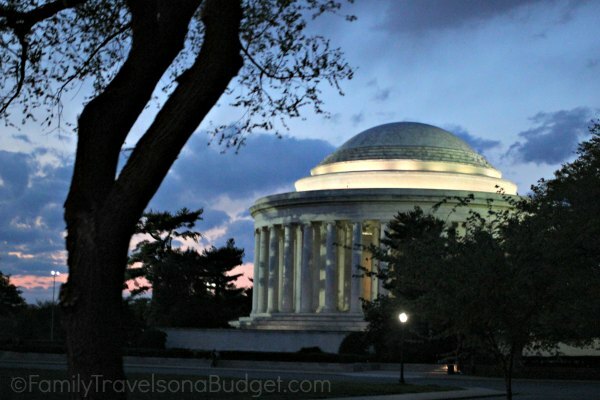 I live only 5 hours from Washington, DC and know there are lots of things to do in DC. 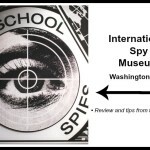 We’ve made many treks up I-95 to enjoy the Smithsonian, Library of Congress and great food that the city offers. I had never heard of Monuments by Moonlight, and I certainly wouldn’t guess it to be all that exciting. Thankfully, my sweet friend and travel buddy, Kendra, was more informed. Some of her friends said that if we did nothing else, we must do Monuments by Moonlight. That’s quite an endorsement. HAHA! Photo credit to the drunk guy. 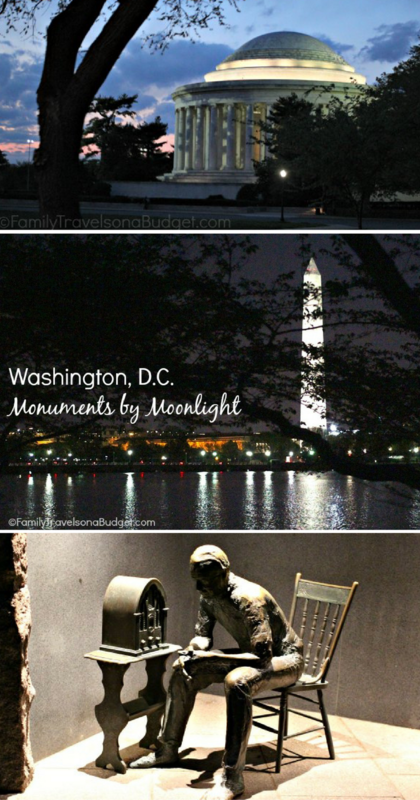 Like its name suggests, Monuments by Moonlight is an after-dark tour of DC monuments. 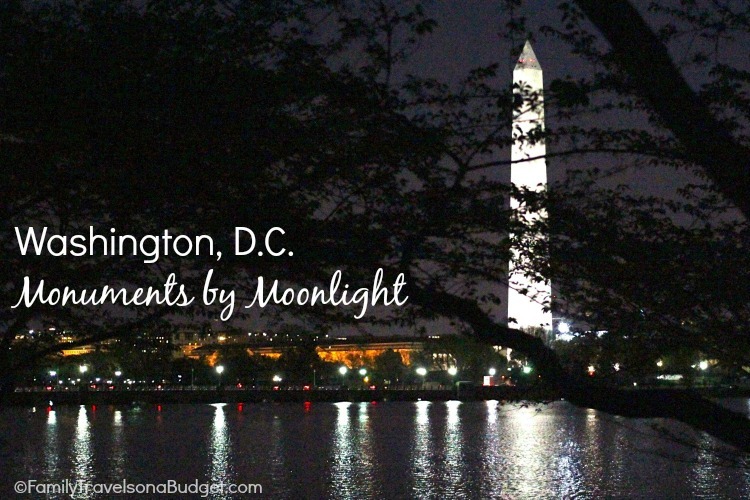 A couple different tour companies offer DC moonlight tours by bus. You could also take a water tour of the monuments. 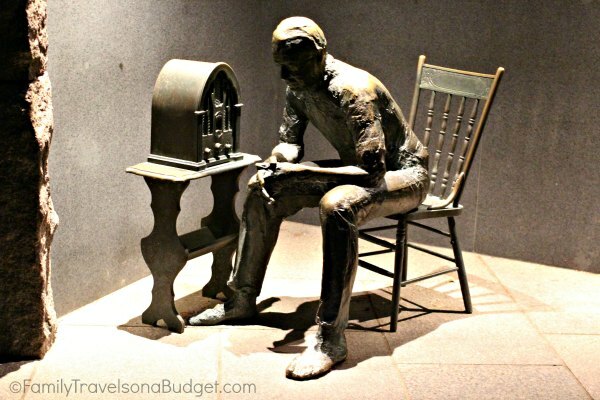 In my opinion, the trolley tour is the way to go as you can visit the monuments, not just look from afar. Destination, D.C. provided our tickets with Old Town Trolley Tours. The tour began with an organized check-in at Union Station. Our guide was fabulous, informative and entertaining. He dropped us off close to the monuments and clearly communicated when to be back on the bus for the next stop. He told stories of Washington’s early presidents — like one who got a speeding ticket for riding his horse too fast in the city! We learned how the Smithsonian Institution (which is actually 19 museums and 9 research centers under one umbrella) started AND where its name came from! We also learned that the capstone at the top of the Washington Monument has an aluminum tip! I wondered if we would be able to hear our guide with the open windows and large crowd on the trolley. No problem! He spoke clearly and the mic system worked well. From beginning to end, this tour was better than expected. Buy tickets in advance! 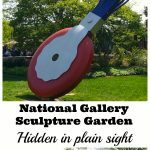 This is one of the most popular tours in DC, so tickets sell out, especially for spring break, the summer travel season and around the holidays. Dress for the weather. The “trolley” has plastic flaps that zip shut, not traditional windows. Expect the windows to be open throughout the tour for better views. It gets cold! Wear comfortable shoes. You’ll get off the bus to visit the monuments and take photos. Wear walking shoes/tennis shoes for this tour! All tours begin at Union Station. Follow the signs to the “tours” area and find your tour company kiosk to check in. It’s best to arrive 30 minutes before your tour. Use the bathroom before your tour. You’ll have an opportunity to use the restroom during the tour, but you might wait in line and miss seeing the monuments. In spring, the 7:30 tour is great. It starts before it gets completely dark so you can watch the sun set during the first part of the tour. By the time you get to the monuments, it will be dark outside. The tour is suitable for all ages, as long as younger kids can handle the late night. 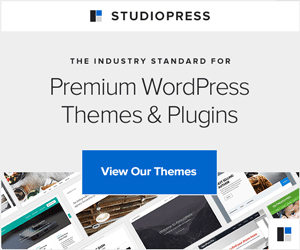 Consider bedtimes and how busy your day is before scheduling. Full-price tickets for this tour are around $39/person, which is definitely a splurge! With so many free things to do in DC, I think it’s worth it for a number of reasons. Safety: Doing a self-guided tour after dark means driving in these congested areas among distracted tourists. Bike, walking, segway and bus tours take huge numbers of guests to each monument which makes driving tricky. Information: Tour guides’ stories add flair to the tour you can’t get on your own. Entertainment: Seeing the monuments after dark highlights features you won’t see in bright sunlight. All day long you can explore the monuments and read the plaques. Let the magic after dark delight you. Excellence: Every person on our tour loved it! The buses seat about 50 people. That’s a big endorsement! 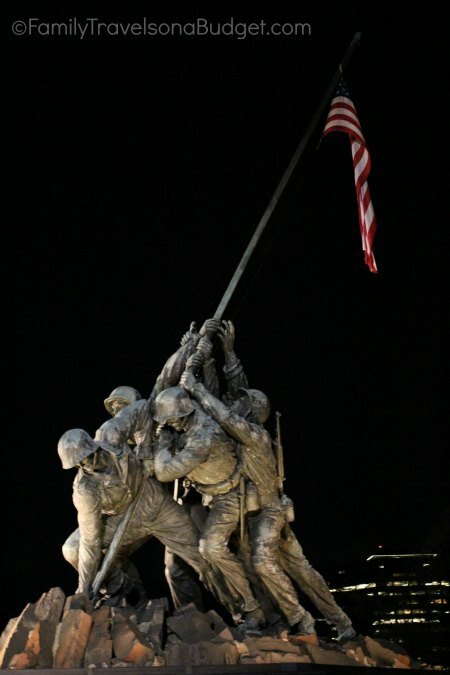 If you need more, TripAdvisor ranks Monuments by Moonlight #14 of the more than 100 tours and activities in DC. It’s also ranked one of the DC area’s 20 best kept secrets by Fox News. 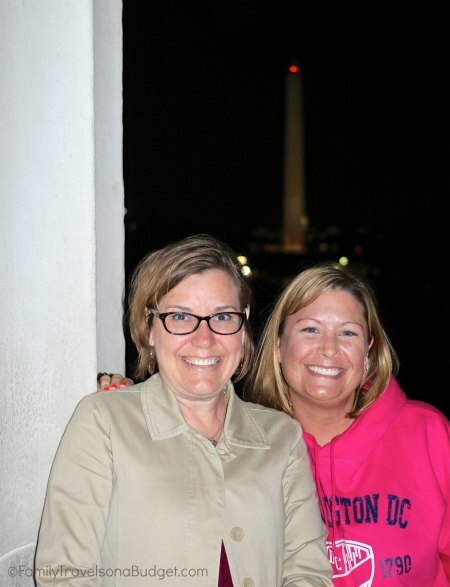 Of all the things I’ve done in DC, the Monuments by Moonlight tour is the best! Truly, when you see DC after dark, you see it in a whole new light. It’s a memory you’re sure to treasure. I have to mention the Korean War Memorial. It was the last one we walked through that night and it left me completely speechless. It was so beautiful and realistic. The twilight definitely added to the drama. Even now as I type this I have chills again and tears in my eyes from this haunting memorial’s reminder, “Freedom is Not Free”. I loved seeing this with you. The floral wreaths left there from Korean visitors was incredible too.